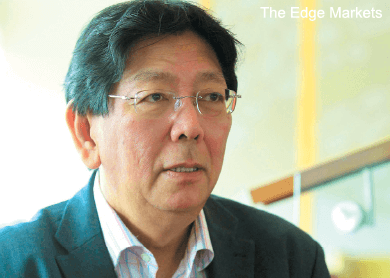 A proliferation of mobile devices may have led to softer demand for personal computers (PCs) and laptops, but it is not all doom and gloom for the hard disk drive (HDD) industry, says JCY International Bhd financial director and non-independent executive director Datuk James Wong King Kheng. This is because HDDs are a cheaper alternative to the solid-state drives (SSDs) that cater for the ever-growing need for content storage, he adds. “If you look at the ecology of this system, the drop in PCs is made up for by an increase in enterprise hard drives for near-line storage,” Wong points out. Near-line storage is used by corporations, including data warehouses, as an inexpensive, scalable way to store large volumes of data. According to Wong, each gigabyte (GB) of SSD costs about 30 to 50 US cents, which is 10 times more than the cost of each GB of HDD. 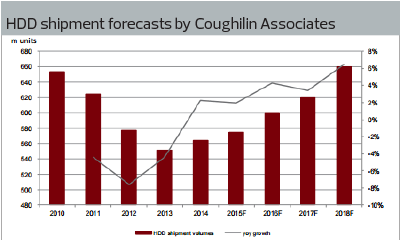 Although global PC shipments rose 3% year on year last year, Wong sees less than rosy prospects for the HDD market this year. Concurring with consensus, he says the usage of PCs and laptops will continue to decline, which would result in flat growth in the HDD market this year. “There might [even] be a small decline but that decline would be in [the] PC [segment] and not in the enterprise [market],” he tells The Edge. JCY, which manufactures four main HDD mechanical components, namely base plates, top cover assembly, actuator pivot flex-circuit assembly and anti-discs, supplies to the largest computer HDD manufacturers in the world, including Seagate Technology LLC and Western Digital Corp. It produces about 25% of the world’s HDD base plates and commands 8% to 28% of the global market, depending on the product. The company bounced back from a net loss of RM61.61 million in its financial year ended Sept 30, 2013 (FY2013), to register a net profit of RM120.09 million in FY2014. This was on the back of an increase in volume shipped and an improvement in the average selling price, the company said in a Nov 26 announcement to Bursa Malaysia last year. The counter closed at 80 sen last Thursday, up 70.21% from a low of 47 sen on Dec 16 last year, giving the company a market capitalisation of RM1.6 billion. It is trading at a forward price-earnings ratio of 10.83 times. JCY has a dividend policy of distributing at least 50% of its earnings. It paid out a total of 4.25 sen in FY2014, which, based on its 80 sen close last Thursday, translates into a payout ratio of 76% and dividend yield of 5.3%. Its closest peer, Notion VTec Bhd, has been in the red for two straight quarters and did not pay any dividends in its last financial year. The stock closed at 40.5 sen last Thursday, giving the company a market capitalisation of RM107.31 million. Moving forward, Wong hopes JCY (fundamental: 2.10; valuation: 1.80) will be able to sustain its profitability for the rest of the year. Due to the strong US dollar, it raked in a net profit of RM50.19 million in 1QFY2015 ended Dec 31, up 65.89% from RM30.25 million a year ago. He is positive about the company’s current order book following quality issues among its peers. On the average selling price of the four components, Wong believes it will continue to decrease as new technology is introduced that is more cost-effective. As for potential mergers and acquisitions, he says JCY is in talks with several parties but nothing has been finalised yet. “The price has to be right,” he remarks. As at Dec 31, 2014, the group had cash and bank balances of RM320.62 million and total short-term borrowings of RM111.56 million. Talking about the HDD sector, Wong says there may be some M&A but the problem for HDD parts manufacturers lies in their capability to make multiple products. “It’s a consolidation [mode in the industry]. If you don’t have economies of scale, it will be very challenging for the companies,” he cautions. He opines that the catalysts in the HDD market include pent-up demand from new gaming consoles (Xbox and PlayStation), increased usage of surveillance cameras and equipment on aircraft that record engine performances. Meanwhile, JCY is contemplating building another plant in Johor Baru. “It all depends on the land cost and degree of savings we achieve in the future,” says Wong. The group also has plants in China and Thailand. As a supplier, JCY would benefit if Hitachi Global Storage Technologies (Hitachi’s hard drive business) and Western Digital merge in China (see accompanying story). That aside, Seagate is reportedly investing RM1.05 billion in Penang, where it will purchase land to support its operations. This is good news for JCY because its plants are mainly in Malaysia while Seagate’s are located in Thailand and China. The company supplies limited volumes of base plates, top covers and anti-discs to Seagate, which accounted for only about 10% of its income in FY2014. Note: The Edge Research’s fundamental score reflects a company’s profitability and balance sheet strength, calculated based on historical numbers. The valuation score determines if a stock is attractively valued or not, also based on historical numbers. A score of 3 suggests strong fundamentals and attractive valuations. Visit www.theedgemarkets.com for more details on a company’s financial dashboard. This article first appeared in The Edge Malaysia Weekly, on April 27 - May 3, 2015.